Cell death is essential to our health. However, when the process goes haywire, it puts our health at stake. Two recently published reviews shed new light on cell death and the role it plays in cancer and inflammation-related diseases, such as atherosclerosis, systemic lupus erythematosus (SLE), rheumatoid arthritis, sepsis, and diabetes. We now recognize that defects in efferocytosis [the way the immune system cleans up dead cells], including defects in the proper processing of ingested cellular corpses, can lead to inflammatory and autoimmune disorders. Cell death is required for our normal health and is a choice that our cells have to make, sometimes voluntarily, other times accidentally. The disruption of the cell death mechanism can often contribute to cancer and other diseases. The body aims to maintain balance, also called homeostasis. Without this balance, our health fails and disease increases. Cell death is also the body’s way of defending itself against pathogens, such as bacteria, viruses, and even toxins. Whenever a cell is damaged or infected with bacteria, cell death is the process used to cull it from the flock. The immune system then comes along to sweep up the mess. The factors that can trigger cell death are diverse. 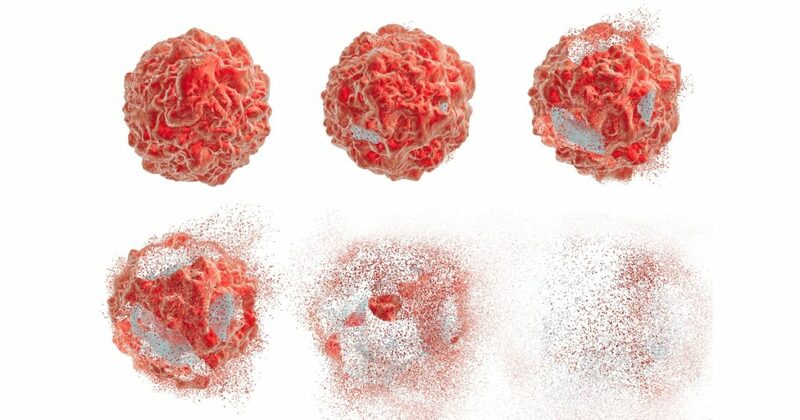 The molecular mechanisms of cell death and cell survival are complex and often intertwined with other cellular machinery, such as that for cell proliferation, cell differentiation, thus casting a broadly connected signaling network. Unfortunately, programmed cell death does not always work as planned, and when the system goes haywire, it leads to big trouble in the body. When the normal cell death and clearance process gets out of whack, it leads to diseases such as cancer, neurodegeneration, and autoimmune conditions. A cell can degrade in three principal ways, including autophagy, apoptosis, and necrosis. When a cell dies, it leaves a corpse which cannot stick around forever. The immune system acts as the body’s housekeeper and employs phagocytes, specialized white blood cells that engulf our dying cells. Phagocytes continually patrol our tissues on the lookout for dying cells, who broadcast a “come get me” message. And if the dying cell is transmitting an “eat me” signal, then the phagocyte engulfs it. Cell death can be either pro- or anti-inflammatory, and phagocytes are the gatekeepers of inflammation. Autophagy is considered a pro-survival mechanism, and is part of the cell’s stress response mechanism, helping the cell survive during lean times. Excessive autophagy, however, leads to cell death. Autophagy is part of the cell’s stress response and occurs when the cell is experiencing stress or is going through lean times. Autophagy literally means ‘eating oneself.’ Autophagy helps the cell to survive under stressful conditions such as a deficiency of nutrients. When a cell is starving, it can survive by digesting part of its insides. Additionally, autophagy is used to counter cell stress, which occurs when the cellular machinery becomes damaged, or proteins stick together in messy clumps called misfolded proteins. In this case, autophagy removes the danger by digesting the culprits. Sometimes autophagy can become impaired, and this condition brings dire consequences. Apoptosis versus necrosis. Credit: ttsz/Getty Images. Apoptosis or programmed cell death occurs as a healthy and controlled part of an organism’s growth and development. 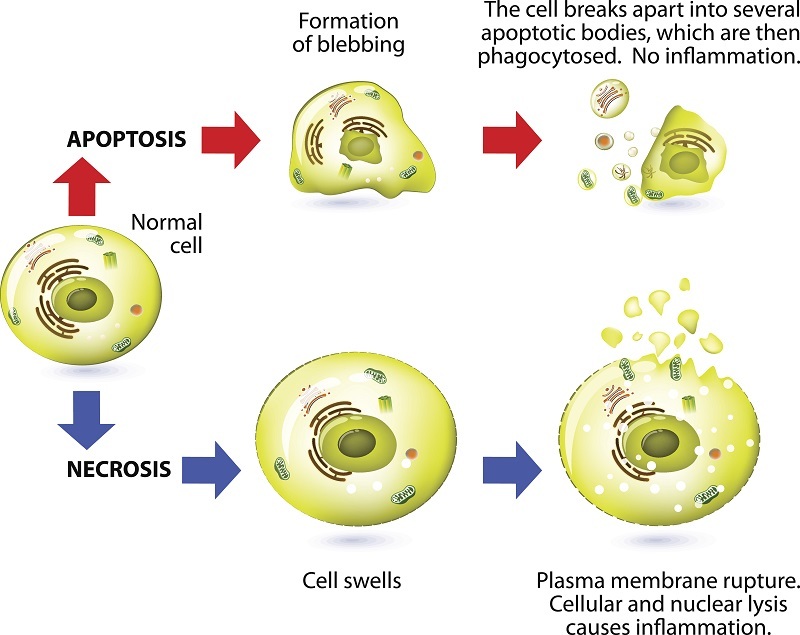 During apoptosis, a cell is broken up into small, self-contained pieces, which are easily recycled by phagocytes. Apoptosis is often kick-started by an accumulation of stress signals, such as too many misfolded proteins, low oxygen or damaged DNA. As well, outside triggers can set off apoptosis by activating death receptors in the cell. To make it easy for patrolling phagocytes to find and kill apoptotic cells, the dying cells release both “come get me” and “eat-me” signals. Once the apoptosis program starts, it cannot be turned off. The cell generates enzymes that destroy it from the inside. Then, a chain of biochemical events leads to other well-defined changes in cell characteristics, which eventually results in death for the cell. 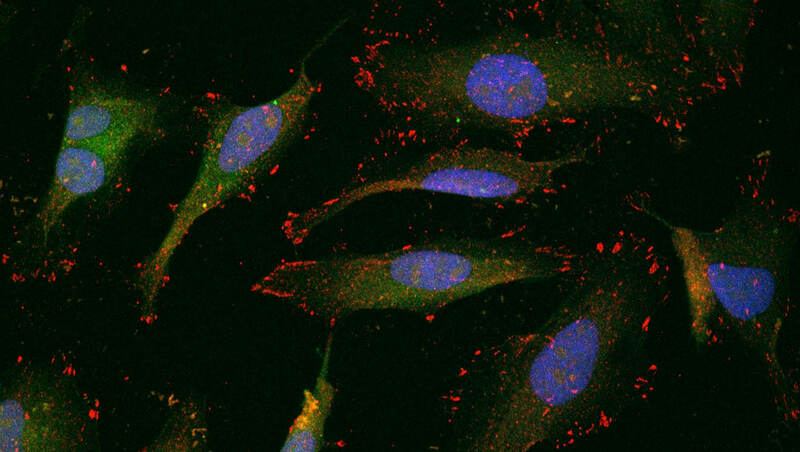 Learn more about cell stress and apoptosis in this report. When a cell dies by necrosis, it bursts and releases its guts into the surrounding tissue. Death by necrosis comes in two forms: passive and programmed. Conventionally, necrosis means a passive, unplanned death of the cell caused by cellular damage or pathogens, in contrast to orderly, programmed death via apoptosis. Necrosis happens in response to high pressure or high temperature. Researchers deem this the passive form of necrosis, as it does not require any specific activity by the cell. Necrosis can be intentional and actively regulated by the cell and is termed programmed cell death. As with passive necrosis, the cell swells until it bursts. However, it is not due to overt external sources, but rather a strictly orchestrated sequence of events. This category of programmed necrosis is in turn subdivided into two more categories: necroptosis, and pyroptosis. The first type of programmed necrosis is called necroptosis, or inflammatory cell death. As with passive necrosis, the cell swells until it bursts due to a carefully orchestrated sequence of events. When the cell bursts, it spills its contents into the surrounding space. Both necroptosis and pyroptosis promote inflammation to alert the immune system of pathogen infection. These components called damage-associated molecular patterns (DAMPs) put the immune system on alert. The second type of programmed necrosis is pyroptosis, a highly inflammatory form of programmed cell death. Pyroptosis typically forms part of the antimicrobial response and occurs when the cell is infected with pathogens. In this process, immune cells recognize that they have invaders lurking within, release pro-inflammatory cytokines, swell, burst and die. They release cytokines which attract other immune cells to fight the infection, which in turn, stimulates inflammation in the surrounding tissue. Pyroptosis promotes the rapid clearance of various bacterial and viral infections by enhancing the host’s defensive responses. Unfortunately, pyroptosis turns against us in chronic pathogenic diseases. In these conditions, the inflammatory response does not completely remove the primary stimulus, as typically occurs in most infections or injuries. As a result, chronic inflammation ensues that damages our tissues. The authors of the UWS-NIEHS study noticed a strong link between necroptosis and pyroptosis and inflammation-related diseases, such as atherosclerosis, systemic lupus erythematosus (SLE), rheumatoid arthritis, sepsis, and diabetes. Both necroptosis and pyroptosis generate bucketloads of DAMPs which inflame the surrounding tissue. DAMPs in the tissue act like blood in the water for sharks. In this case, the ‘sharks’ are the phagocytes and other immune cells. DAMPs cause them to spring into action and produce inflammation. DAMP-induced inflammation can lead to systemic, inflammation, which in turn, can provoke the chronic diseases of aging. Researchers are starting to understand the link between necroptosis and inflammatory diseases, such as atherosclerosis. Researchers have implicated pyroptosis in the development of systemic lupus. As well, scientists have implicated necroptosis in Huntington’s disease, and Amyotrophic Lateral Sclerosis (ALS). Cervical cancer cells metastasizing. Credit: NCI. Sometimes, there is not enough cellular suicide, especially in the case of cancer. Tumors are masters at evading our immune system and avoiding cell death. When cancer cells spread to distant sites or metastasize, to stay alive, they must avoid the cell death pathways. Cancers are talented at avoiding death and have sophisticated mechanisms that hijack components of the autophagy, apoptosis, and necrosis signaling pathways. When they spread through the body, cancers escape cell death by deactivating these pathways. Some cancer drugs work by reactivating the cell death processes to kill the cancer cells. Unfortunately, this doesn’t always work, because cell death pathways do not function in isolation. Provoke one type of cell death, and the cancer cell may switch to a different pathway, thus avoiding its demise. Programmed cell death is normal, but it can sometimes go haywire, leading to serious health problems by provoking systemic inflammation. Cell death is necessary for our health. However, when the process goes astray, it leads to a host of devastating diseases. Taming cell death processes which have gone haywire will not be easy because researchers must first understand the complex subject. Cell death is a multi-disciplinary subject, requiring expertise from all fields of the modern biology. To tackle the complex interplay between disease and programmed cell death, scientists need to develop a holistic view of the many signaling pathways and processes. By gaining a fuller understanding, researchers are hoping to develop drugs that modulate cell death and prevent excessive inflammation, neurodegeneration and cancer metastasis. Please re-share this post and help us spread the word. It only takes one simple click on any of the social media links on this page. Joseph P. Kolb, et al. Programmed Cell Death and Inflammation: Winter Is Coming. Trends in Immunology, Volume 0, Issue 0. DOI: http://dx.doi.org/10.1016/j.it.2017.06.009. Published online: July 19, 2017. Nader Yatim, Sean Cullen, Matthew L. Albert. Dying cells actively regulate adaptive immune responses. Nature Reviews Immunology. Nature Publishing Group. Mar 13, 2017. Link to article. Rebecca SY Wong. Apoptosis in cancer: from pathogenesis to treatment. J Exp Clin Cancer Res. 2011; 30(1): 87. Published online 2011 Sep 26. doi: 10.1186/1756-9966-30-87. PMCID: PMC3197541. Link to article. Diagnosis, Advice, and Treatment: This article is intended for educational and informational purposes only and is not a substitute for qualified, professional medical advice. The information provided herein should not be used during any medical emergency or for the diagnosis or treatment of any medical condition. Instead, consult a licensed physician for the diagnosis and treatment of any and all medical conditions. Call an emergency hotline such as 911, or an equivalent number, for all medical emergencies. Additionally, consult a licensed physician before changing your diet, supplement or exercise programs. Endorsements, Photos & External Links: This article is not intended to endorse specific organizations, companies, or their products. Links to external websites, mention or depiction of company names or brands, are intended for illustration only and do not constitute endorsements.